rocky's bru: Ghani Othman vs ... ? The blogger Annie is so sure that Johor will have a new Menteri Besar after the General Election. The new MB will be from Barisan Nasional, of course, as the Opposition doesn't stand a chance of capturing the Umno stronghold, at least not in PRU13. So far, this Annie has proven to be on the ball where Johor politics is concerned so I have no reason to doubt her posting Johor will have a new Menteri Besar. I assume, then, that Ghani Othman, the incument (and outgoing) MB, will not contest a state seat and will switch to a parliamentary seat. You are wrong.Ghani is not offer any seat to contest in Johore.Not even Parliment. He had problem with his Sultan. I think he will be offera chairman of a GLC co.maybe Sime Darby. 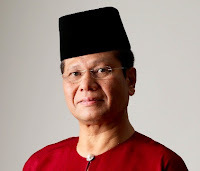 alamak Ghani Othman is contesting yet another term but on a Parliament ticket?Dont joke lah Ghani, you were once a federal deputy min and a minister, then MB Johor for so long.Plse lah Ghani retire lah. Actually you are not bloody good. If you are good why dont you become DPM like your arch rival the boy who was you said is not a Colombo Plan scholar like you, ie Muhyiddin. BN tetap gagah ini memang realiti. Pasti kalah bagai kura-kura sorok dalam kerang. Slogan Ubah memang suatu yang kelakar. Dia dah takut hilang jam OMEGA lagi. He should be kicked out from Johor. Only makes Dato Lim Danga Bay rich. But Dato' Lim is stabbing him by supporting Lim Kit Siang who is contesting In Gelang Patah. Bodoh punya Melayu. Anak Melayu Johor tak akan lupakan dia. BN johor pun dan fed up dengan Ghani. Hehehe this is the best time to bury u and pkr for gud. Both not gud for the country. Baduttt Tali barut penghkianat agama bangsa dan negara. Tak layak cari rezeki d bumi msia. Najib had 4 years to get rid of deadwood why didn't he do it? if Ghani is to contest in Gelang Patah, LKS will be buried unless he go back to Ipoh Garden. hik hik. you really dont know much about politics. najib must send him to gelang patah... or permatang pauh should anwar contests in perak. Gani can win anywhere in the country,not just JB.He will bury all his enemies, inside and outside, this time just wait and see.Hidup Gani! Absolutely correct. The main worry is GE14. Ini komen bodoh. Hapa kejadah nak ke Permatang Pauh. Berangan jadi polical strategist tapi tin kosong.